Pint Freezer Bags Are Getting Rarer! Pint Freezer Bags Are Getting Rarer So You Need To Stock Up! Pint freezer bags really are getting rarer and have been out of stock at many, many stores for a while. So if you can find these rare gems, don’t shy away from stocking up a year’s supply if you can. Currently, there are only 2 brands available: Ziploc and FoodSaver. The Ziploc bags are designed like your traditional freezer bag. Although some FoodSaver bags are zipper-type, most need a vacuum sealer but they are pre-cut into pint sizes for your convenience. The usable area of each freezer bag has dimensions of 7" X 4.75" which is enough to freezer just about a serving of vegetables. They provide perfect storage for small portions of fresh fish, meats, cheeses, veggies and even raspberries, blueberries, corn and green beans which are far more healthful than the canned ones. These and other items will be protected from your freezer’s sub-zero cold, prevent that awful freezer burn and stop the food from spoiling easily. Averting food wastage saves you money so that you don’t have to be at the mercy of those often usurious creditors. These bags also save you time and money in another way. They empower you to make bulk food purchases and buy hugely discounted items (requiring fewer trips to the store); portion them into meal sizes and; freeze. A freeze guard seal helps to lock the juices and nutrients into your meat, veggies and fruits. That way, they won’t taste like rubber when they eventually make it to your plate. They are easy to use as you don’t need a vacuum sealer. So if you don’t already own one, these pint bags are right up your alley. They are offered as a value pack of 4 boxes, each with a count of 20 bags, making a total of 80 bags. And it’s a good idea to buy these value packs in multiples. FoodSaver is another giant in the freezer bag industry. So the FoodSaver pint freezer bags are well worth checking out. These are vacuum freezer bags. They are designed to be used with the FoodSaver heat-seal vacuum sealing system in order to better protect your food from freezer burn. They are pre-cut into convenient pint sizes so that you don’t have to do it yourself with sharp knives and scissors and risk getting hurt. Each bag measures 6” X 9” which is large enough to freeze individual portions of summer berries, corn and even green peas. These bags are a great tool for taking advantage of bulk purchases or sales of hugely discounted items that you then divide up into portion sizes and freeze. From this perspective, the FoodSaver pint freezer bags are huge money and time savers. The bags are made of “Multi-ply” material that is thoughtfully designed to prevent freezer burn. Specially designed channels help block oxygen as well as moisture in order to maximize air removal, create an air-tight barrier around the food and increase its shelf life. They are one of the BPA free freezer bags so if you are keen on keeping this possibly unsafe chemical from your food, it’s a good idea to check these bags out. 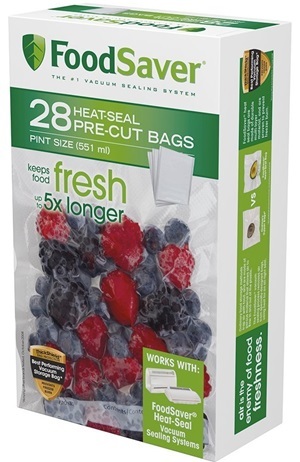 Besides the freezer, these bags are great for use in the refrigerator, and microwave. They can even be safely simmered in a pan. And they can be used to store dry items, such as cookies and snacks in your pantry. A white labeling area on the clear bag is a great place to write the contents and the date they are frozen. This makes it easy to identify and retrieve them from the freezer when it’s time to use them. Each pack comes with 28 pint-size, pre-cut bags. These are enough to last you an entire 4 weeks if you use one bag a day.